TPU came across pictures of the MSI Barricade, a new mid-tower ATX case with a MSRP of $79.99. Pictured below, the Barricade (model no: IN-535) is an ATX mid-tower case measuring 450(L) x 185(W) x 412(H) mm, weighing 7.8 kg, made of steel and ABS. 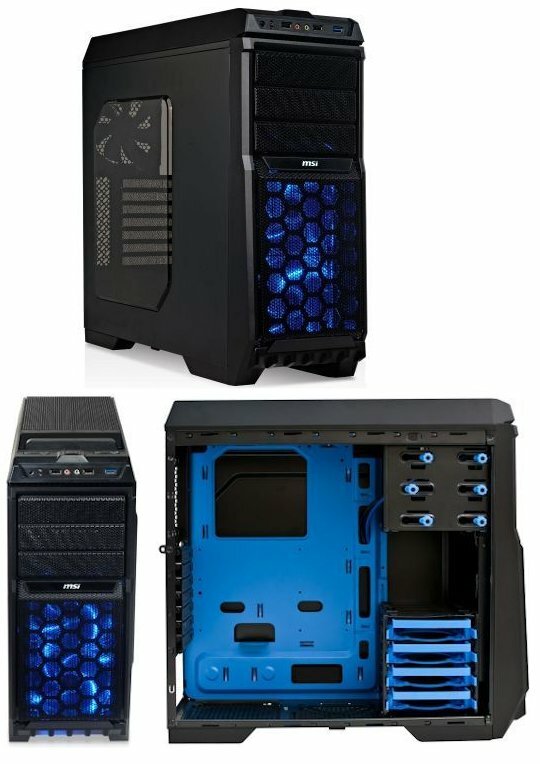 It features a mostly-perforated front, with its utility panel (1x USB 3.0, 2x USB 2.0, HDA front-panel jacks), three 5.25-inch drive bays, and a large intake for two 120 mm blue LED-lit fans. Its interiors, including its motherboard tray, are mostly colored in the same shade of blue as the MSI logo. Apart from the three 5.25-inch bays, the Barricade features four 3.5-inch bays with support for 2.5-inch drives. The motherboard tray has cutouts for cable and CPU cooler management. Ventilation includes two 120 mm front intake fans, one 120 mm top exhaust fan, and provision for additional bottom and rear fans.